If you're the parent of a two-year-old, then spending time at your neighborhood playground is practically a weekly, if not daily, outing. It's not always my favorite way to spend time... sometimes it is downright boring to push a swing over and over again, it can be brutally hot in the summer, and I certainly don't enjoy the "it is time to go home now" battles. But even I will admit that it can be a great time-killer and energy-burner. But when we're on vacation? I always love finding a good playground. There's a certain element of discovery (not just in tracking down the location itself, but The Arrow loves exploring some new equipment). Sometimes the scenery itself is gorgeous, like this playground that bordered the ocean in North Redington Beach, Florida. Being from Indaina, we don't often play under the shade of palm trees afterall. It was a perfect place to let The Arrow get the wiggles out before we sat down to a nice dinner during our trip to Tampa/St. Petersburg. 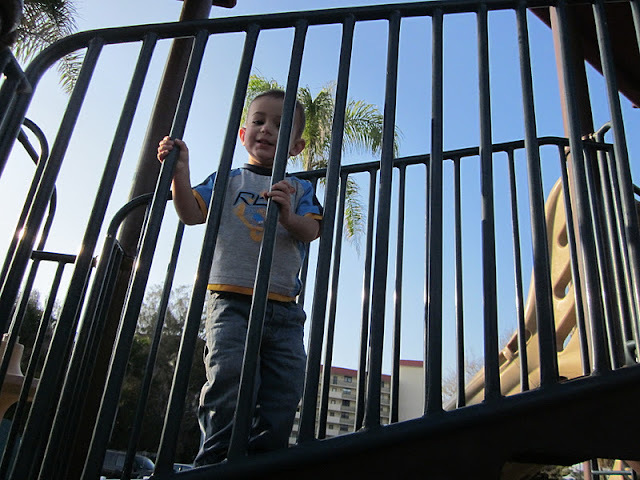 A roadside playground can be a lifesaver on a long road trip. Some fresh air and lots of body movement opportunities! This playground in Peoria, Illinois was attached to a Joe's Crab Shack right on the riverfront area. At the halfway point on our drive from Indiana to Iowa City, we all needed a little break. 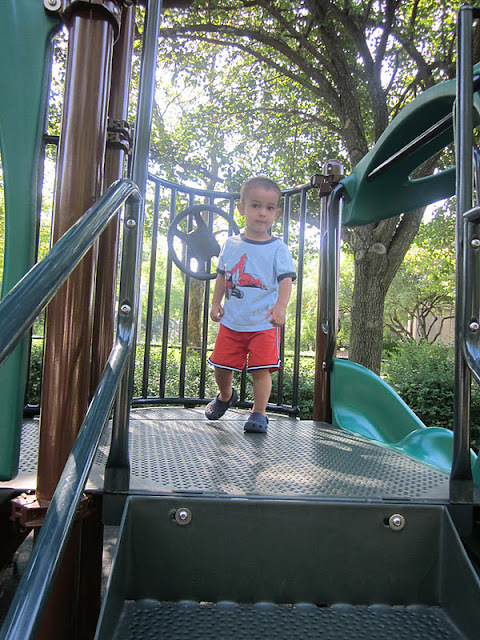 Our Boston trip was jam-packed with sightseeing, which often meant The Arrow was confined to a stroller or sitting still on the T. The playground in Southwest Corridor Park just outside our Jamaica Plain rental house was such a great way for him to burn off steam. We've even celebrated some "firsts" while checking out playgrounds on vacation. 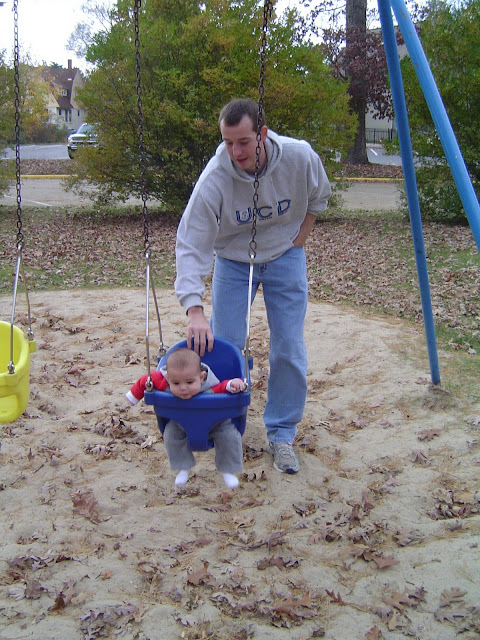 When we ran out of baby toys to entertain then six-month old Arrow during our first family vacation in South Haven, Michigan, we ventured to the park and he got to experience the thrill of his first time on the swings. He may have been wee bit too small for it, but it was love at first sight, as he's still swinging to this day! So if you find your kids are getting a little cranky on a trip, ask yourself if you've incorporated enough play. And then hit the local park or recreation area and let them loose for an hour or two! You may even get a feel for what it's truly like to live in the area you're visiting by talking with some local moms and dads. Any favorite playground memories from your travels? Please share them in the comments! We almost always stop for lunch on a trip only after we've found a playground to eat at and then let the kids tire themselves out--the drives go by much easier/quieter that way! The baby is really very cute! As per my experience a playground is the only place a child wants to be. Nice post. This is also a point on family vacations. Children enjoy a nice change of scenery on other places.